Flashback to the third quarter of last year: it’s somewhat remarkable how much has transpired over the past 12 months. A year ago, investors were still digesting news of the June Brexit vote and had only just absorbed the first of three U.S. presidential debates leading up to the November election. As we conveyed at the time, the only sure thing was that the next 12 months would bring an uncertain and likely shifting geopolitical landscape. This situation underscored the importance of focusing on known facts. Twelve months later, the equity markets have gravitated higher, supported by improving U.S. corporate earnings and bolstered by solid fundamentals in most developed markets. However, the Trump rally that fueled equities in the first half of the year has largely fizzled out. The ongoing strength of domestic equity markets has been driven in part by the resiliency of the economy. Q2 GDP was revised upward to 3.1% in September, spurred by robust business spending and personal consumption. The Institute of Supply Management (ISM) Manufacturing Index again came in at a positive level in August, showing solid growth in production, new orders, backlogs, and exports. The ISM non-manufacturing report was not quite as strong, but did become more firm, reversing a July contraction, and showed growth in all but two of the non-manufacturing industries. If there was an area of concern, it was largely related to the potential economic impact of Hurricanes Harvey and Irma. Retail sales came in soft in August with a 0.2% contraction. The unemployment rate remained healthy, coming in at 4.4% in August. The S&P 500 finished the quarter 4.5% higher, showing strength throughout July and most of September (Exhibit A). The ascendant trajectory was interrupted only by bouts of choppiness in the second and third weeks of August related to growing tensions in North Korea and speculation that economic advisor Gary Cohn might resign following the president’s controversial Charlottesville remarks. Those fears proved unfounded and Cohn spearheaded the framework of the GOP’s tax-reform proposal that energized domestic markets in the last week of September. One of the biggest questions heading into the quarter was whether Washington could reach an agreement to increase the debt ceiling and avoid a government shutdown. The confrontation was averted when President Trump supported a deal to couple a short-term extension to the debt ceiling with a Hurricane Harvey relief bill. Congressional leaders, however, will have to revisit the topic in mid-December. 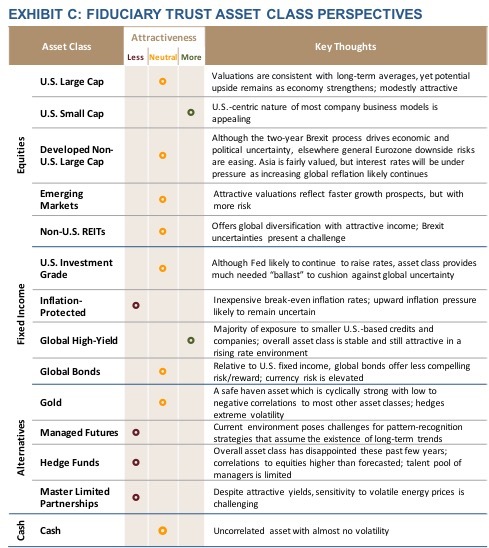 On the outlook for U.S. equities, we see the asset class as modestly attractive. The consensus earnings growth estimate for the S&P 500 for the next 12 months is 17%, and in Q2 nearly three out of every four reporting companies (73%) topped analyst EPS estimates. With a forward P/E of 18x, valuations are slightly high, but not alarmingly so. Several factors support U.S. equity strength. The Fed will most likely remain in an accommodative mode, and signs indicate that earnings will show continued strength. If Trump does succeed in achieving tax reform, it is quite possible that markets will see another rally, similar to that of the last two months of 2016. 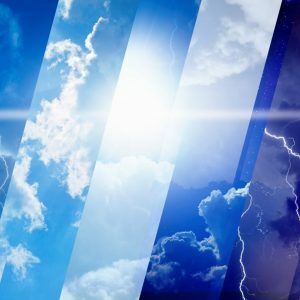 The U.S. markets have shown remarkable resiliency to a range of negative events this past quarter, including North Korea’s military aggression, devastating twin hurricanes, and the London terrorist attack. Contrary to most expectations, inflation growth in the U.S. has been non-existent. History and basic economics (known as the Phillips Curve) demonstrate that decreasing unemployment should drive wage increases. Over the past few years, the broader global economies were uneven in growth, partially explaining why inflation was not picking up. Now, the major world economies, including Japan, the U.K., and Europe are growing faster, but inflation remains stubbornly low in the U.S.
We don’t currently see any signs of growing inflation on the horizon. However, if the employment picture continues to improve, wage growth will pick up and lead to some inflation. It will be important to adjust economic data for the two hurricanes this past month, as temporary spikes in demand for fuel could be misinterpreted as true price increases. In summary: if the labor market gains strength, then wage growth won’t be far behind, which should drive inflation. The Federal Reserve’s intention to raise rates has been challenged by this absence of any material inflation. At the September Federal Open Market Committee meeting, the Fed provided a bullish forecast for GDP, but trimmed its inflation expectations for the balance of the year and 2018. Still, the Federal Reserve indicated that it would begin a gradual reduction of its balance sheet, opting to not replace maturing Treasury bonds and mortgage-backed securities. The Fed left its benchmark interest rate at its current 1% to 1.25% target, but suggested that a rate hike could be forthcoming in December. In September, the Fed vice chair resigned unexpectedly, leaving the committee with four of its seven seats unfilled in October. In February 2018, Chair Yellen’s term expires. Any vacancy of a Fed board member can exacerbate market anxiety, because a voting member can have an impact on policy. In addition, there will likely be vacancies at the vice chair and chair level, fueling further skepticism around the direction a new Fed board may take against inflation. In spite of remaining geopolitical uncertainty, the world growth picture looks bright. The Organization for Economic Cooperation and Development (OECD) tracks the world’s major economies. 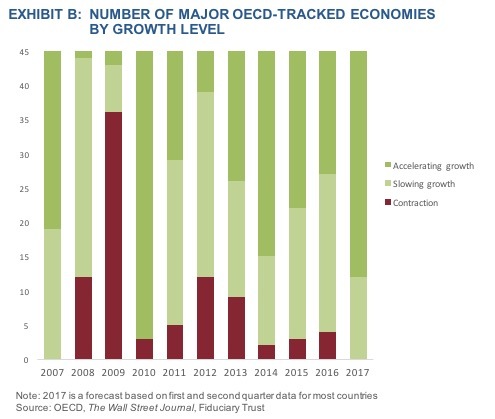 Based on the first and second quarters of 2017, it appears that all 45 countries measured by the OECD are on track for growth—for the first time in over 10 years. Over 70% of the major economies are expected to accelerate their growth from last year, supported by low inflation worldwide and accommodating central banks (Exhibit B). While geopolitical uncertainty still colors the domestic picture, international developed markets have gained some clarity. German Chancellor Angela Merkel comfortably won a fourth term in the last week of September, providing a sense of ease for investors in the Eurozone. She will face new challenges in forming a coalition, however, as the right-wing nationalist party gained a presence in parliament. In Norway, Conservative Party leader Erna Solberg was also re-elected as Prime Minister on a platform to cut taxes and drive economic growth. In Asia, Japanese Prime Minister Shinzo Abe also called a snap election scheduled for October 22. Should he win, Abe’s reelection would likely see Japan build upon economic reform efforts. The MSCI EAFE Index, measuring international developed markets excluding the U.S. and Canada, continued its strong run, advancing 5.4% in the third quarter and 20% year to date. The performance across Europe and Asia was somewhat choppy in August, however. The amplifying aggression on the Korean Peninsula weighed on international equities, but dollar weakness helped prop up international stocks. The MSCI European Monetary Union Index posted a 8.1% gain in the quarter and has so far added 26.8% year to date, while the MSCI Pacific Index logged a 3.9% gain in Q3, adding to its 15.4% advance so far in 2017. The solid baseline of economic strength should continue to bolster international developed equities. The European Central Bank (ECB) will continue its balancing act to foster further growth without inflation. As long as the ECB does not prematurely wind back its bond-buying program, the outlook for the Eurozone remains positive. Germany is very optimistic about the future of its business conditions. And most investors anticipate that any potential deterioration in future indicators will be recognized, allowing time to adjust exposures as necessary. Emerging market (EM) stocks in the third quarter continued to build upon strong gains from the first half of the year, bolstered by a weaker dollar, which has provided a tailwind for commodity-producing nations. The MSCI Emerging Markets Index added another 7.9% over the past three months and has gained 27.8% year to date. The broader EM index has also benefited from global investors’ ongoing search for yield. South Korean stocks experienced some volatility in the third quarter, which was unsurprising, given the escalating tensions in the North. However, strong fundamentals drove investor interest and the Korean market even managed to build slightly on gains from earlier in the year. Among the laggards, Greek stocks suffered losses in the third quarter on unemployment concerns and other lingering economic worries. Once a commodity-driven asset class, EM stocks today increasingly reflect strengthening domestic consumers and growth from technology companies. Tech stocks have led the price rally and remain undervalued. 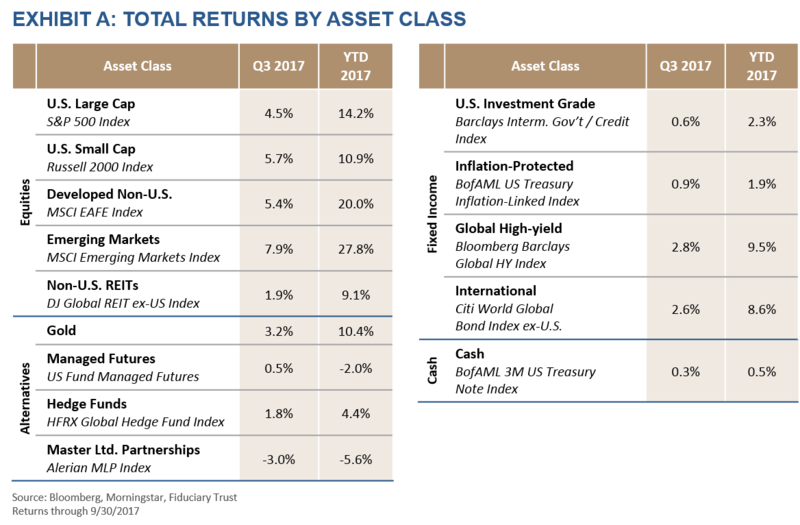 We expect the asset class to show continued growth through the end of the year. 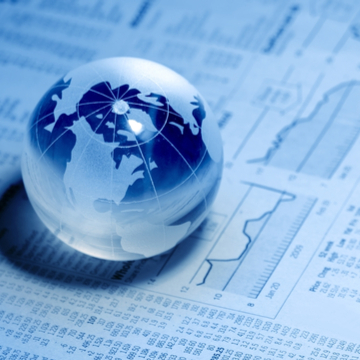 However, it is important to look at the fundamentals by country as they can vary considerably. The weakening dollar has become a theme across the investment landscape. As discussed in our Q3 market commentary, the three factors that could support a stronger dollar include the success or failure of the administration’s policy agenda, the potential for higher interest rates, and the health of the U.S. consumer market. As a result, the dollar remains under considerable pressure, since hope for Trump’s policy changes has subsided. The lack of momentum, combined with low interest rates, has kept the dollar at low levels versus the euro. 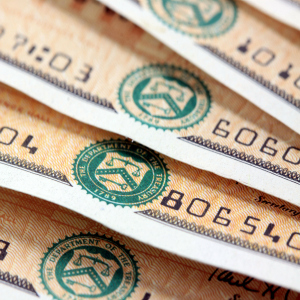 However, there is evidence to suggest the dollar has reached such a deep discount that it is bound to regain some of its strength in the fourth quarter. This recovery would certainly be bolstered by a possible interest rate hike from the Fed, as higher rates attract more buyers and would drive the dollar higher. Also, in the last week of September, the GOP unveiled its proposal for tax reform, which could add further support. When the year began amid the extended Trump rally, it appeared that a transition was underway in which fiscal policy would drive the markets, while monetary policy receded to the background amid rising interest rates. Since the policy changes have not yet materialized, we expect the markets to remain largely driven by fundamental earnings growth and central bank policies. Exhibit C summarizes our outlook by asset class.